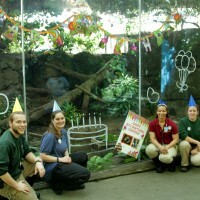 It was a day for celebration at the Rainforest Pyramid today as we celebrated not one but two very special birthdays! Cooper joined Moody Gardens when he was just 18 months old! 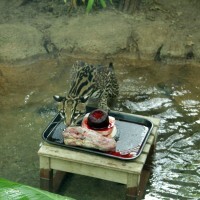 Ocelot’s are carnivores and in the wild, they eat small mammals, birds and fish. 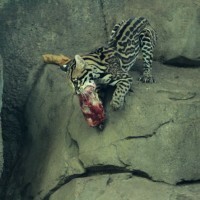 Ocelots are listed as endangered by U.S. Fish & Wildlife Services (USFWS). Once abundant in many areas throughout the southwest United States and Mexico, today the animal has almost disappeared. It is estimated that as few as 120 ocelots survive in Texas alone. 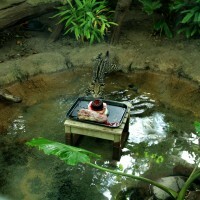 In Central and South America, the ocelot is still hunted for its fur and captured for the pet trade. Fun Fact: Cooper LOVES cinnamon and peppermint! Trainers use these spices as a form of enrichment when working with this amazing animal. Davita is a very special resident of the Rainforest Pyramid. 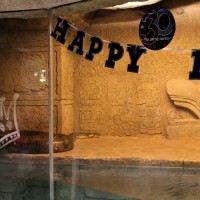 She first lived at the Bronx Zoo then the Indianapolis Zoo before she ended up here at Moody Gardens. She’s about 14 feet long and weight anywhere between 90-115 lbs. Anacondas are slow on land but in the water, they are swift and stealthy hunters. 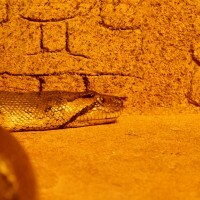 They eat birds, mammals or other reptiles. Fun Fact: Davita enjoys swimming through wheat grass! So much so that MG staff ordered her some specially for her birthday. 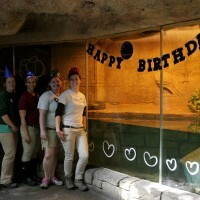 The Rainforest Pyramid staff threw Cooper a birthday bash! 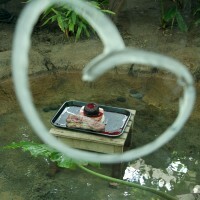 Cooper got a very special birthday cake made out of goat’s milk gelatin, blood ice block and a side of bone. and decided to start with the bone! Staffed then moved on to celebrate Ms. Davita’s big 30th birthday! Davita was the center of attention on her birthday! Previous Previous post: MG Sweetheart Scavenger Hunt!